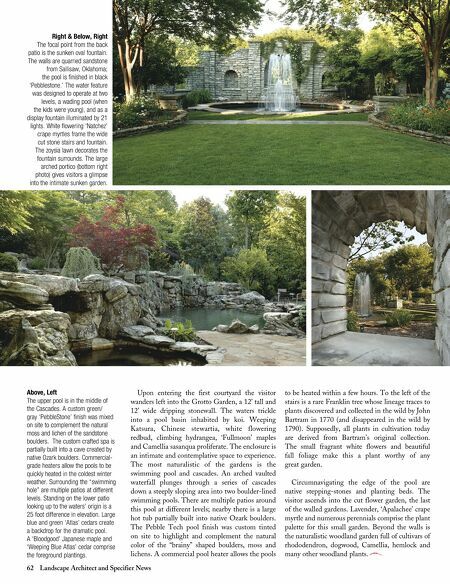 62 Landscape Architect and Specifier News Upon entering the first courtyard the visitor wanders left into the Grotto Garden, a 12' tall and 12' wide dripping stonewall. The waters trickle into a pool basin inhabited by koi. Weeping Katsura, Chinese stewartia, white flowering redbud, climbing hydrangea, 'Fullmoon' maples and Camellia sasanqua proliferate. The enclosure is an intimate and contemplative space to experience. The most naturalistic of the gardens is the swimming pool and cascades. An arched vaulted waterfall plunges through a series of cascades down a steeply sloping area into two boulder-lined swimming pools. There are multiple patios around this pool at different levels; nearby there is a large hot tub partially built into native Ozark boulders. The Pebble Tech pool finish was custom tinted on site to highlight and complement the natural color of the "brainy" shaped boulders, moss and lichens. A commercial pool heater allows the pools to be heated within a few hours. To the left of the stairs is a rare Franklin tree whose lineage traces to plants discovered and collected in the wild by John Bartram in 1770 (and disappeared in the wild by 1790). Supposedly, all plants in cultivation today are derived from Bartram's original collection. The small fragrant white flowers and beautiful fall foliage make this a plant worthy of any great garden. Circumnavigating the edge of the pool are native stepping-stones and planting beds. The visitor ascends into the cut flower garden, the last of the walled gardens. Lavender, 'Apalachee' crape myrtle and numerous perennials comprise the plant palette for this small garden. Beyond the walls is the naturalistic woodland garden full of cultivars of rhododendron, dogwood, Camellia, hemlock and many other woodland plants. Above, Left The upper pool is in the middle of the Cascades. A custom green/ gray 'PebbleStone' finish was mixed on site to complement the natural moss and lichen of the sandstone boulders. The custom crafted spa is partially built into a cave created by native Ozark boulders. Commercial- grade heaters allow the pools to be quickly heated in the coldest winter weather. Surrounding the "swimming hole" are multiple patios at different levels. Standing on the lower patio looking up to the waters' origin is a 25 foot difference in elevation. Large blue and green 'Atlas' cedars create a backdrop for the dramatic pool. A 'Bloodgood' Japanese maple and 'Weeping Blue Atlas' cedar comprise the foreground plantings. Right & Below, Right The focal point from the back patio is the sunken oval fountain. The walls are quarried sandstone from Sallisaw, Oklahoma; the pool is finished in black 'Pebblestone.' The water feature was designed to operate at two levels, a wading pool (when the kids were young), and as a display fountain illuminated by 21 lights. White flowering 'Natchez' crape myrtles frame the wide cut stone stairs and fountain. The zoysia lawn decorates the fountain surrounds. The large arched portico (bottom right photo) gives visitors a glimpse into the intimate sunken garden.